I've always been a fan of anything Egyptian, and I've always tried to add a new piece to my collection whenever I could. 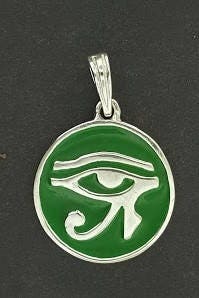 This pendant was made to add to my magical talisman collection, worn in the old days to protect against the evil eye or misfortune. Ancient pharaohs were buried with them to safeguard them in the afterlife. King Tutankhamen was buried with 18 of them on his person alone! This pendant is in sterling silver and is 1 1/2 inches wide. The bail is soldered so there's no chance of it falling off. The inside is treated with a metal enamel that is permanent(it's not paint that will peel off in a heartbeat!) I can also make it in the color the you wants!